Happy Friday! I hope you have all had a wonderful week! Mine has been packed with mom duties, teacher appreciation activities for two local schools, PTO, work, and just the regular busyness of life. My husband has been in the Dominican Republic all week serving on a mission trip. They are building a house for a family there! They have completed the house and he will be on his way back home tomorrow. This is his sixth mission trip and his heart for serving others makes me so proud. He's a good man! Today, I'm excited to introduce you to Grace and Emma, a boutique filled with affordable feminine and fashionable pieces. 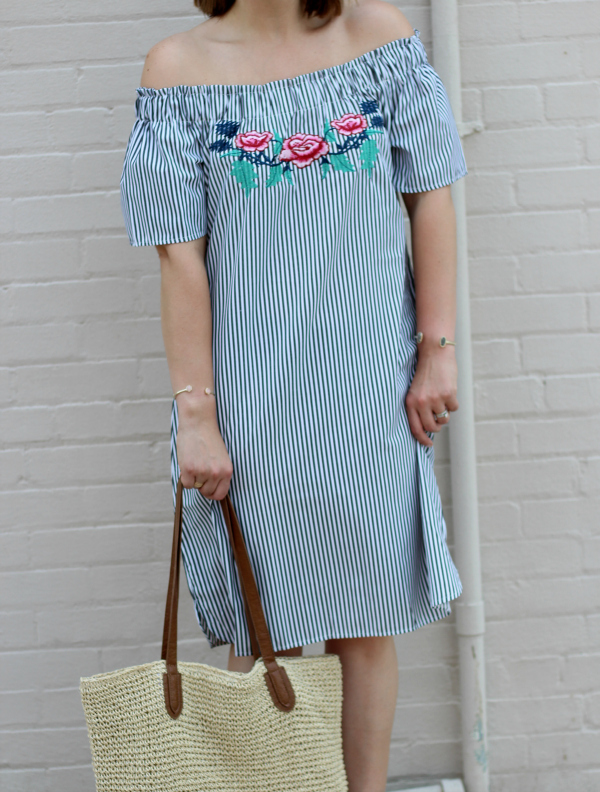 They sent me this adorable embroidered off the shoulder striped dress to style for y'all and I'm in love with this dress! It has so many of my favorite things all in one piece. 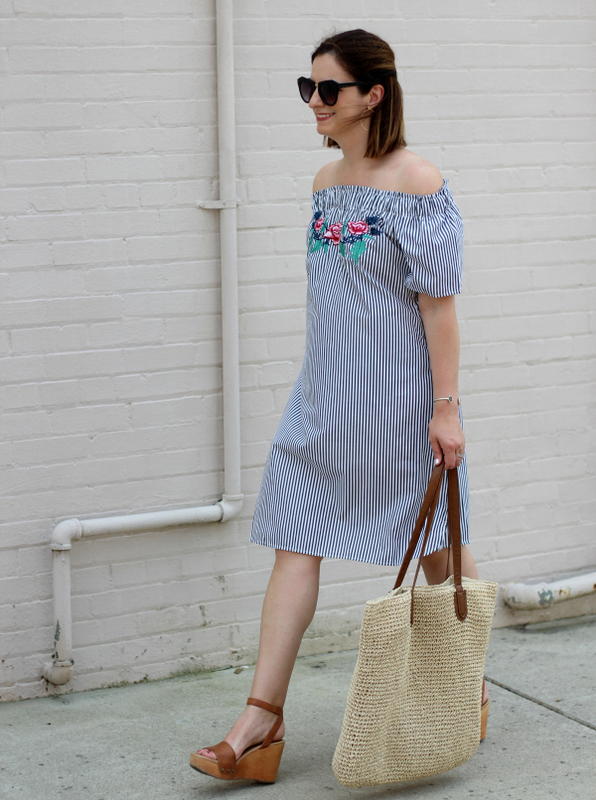 I styled it with my favorite straw tote and neutral wedges. I let the dress be my statement piece and kept all of my accessories simple. 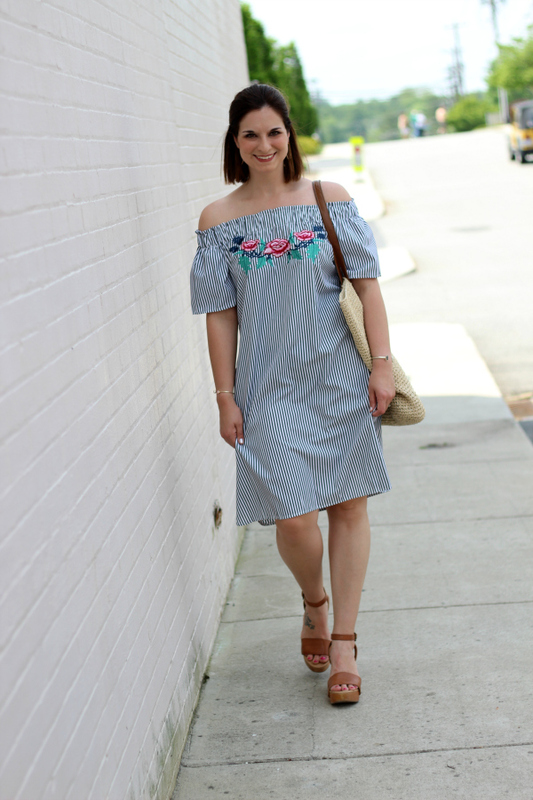 Like I mentioned in yesterday's post, I love dresses and they are the best for feeling put together and fast! I typically only post Monday through Friday but I'll have a bonus post up tomorrow to share my weekly roundup of what I'm currently loving so come back! Thanks so much for stopping by today! Enjoy your weekend! That dress is so cute on you! Hope you have a great weekend! Love this dress! 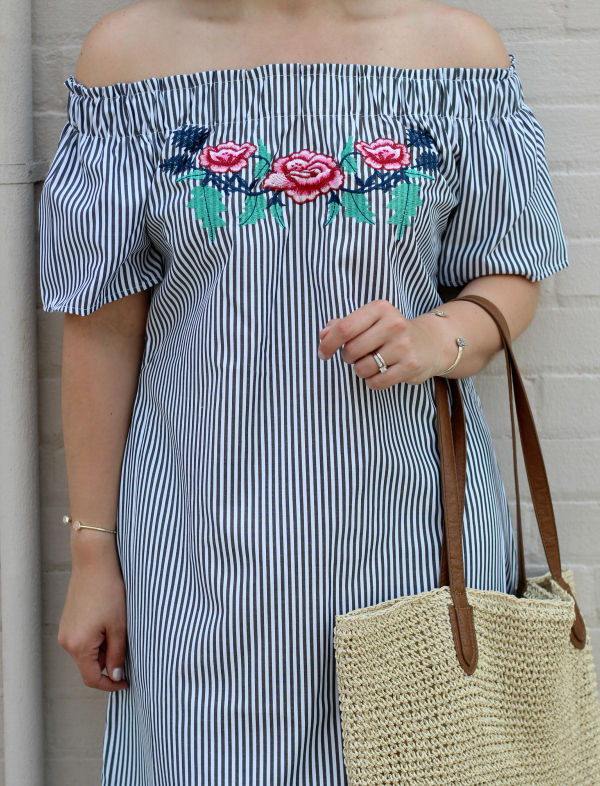 The stripe and embroidery are sooo cute! What a fun dress! So prefect for spring/summer day to night outfits. Thats so amazing of your husband for going down there and doing that,hope he has safe travels on his return to you and the fam! 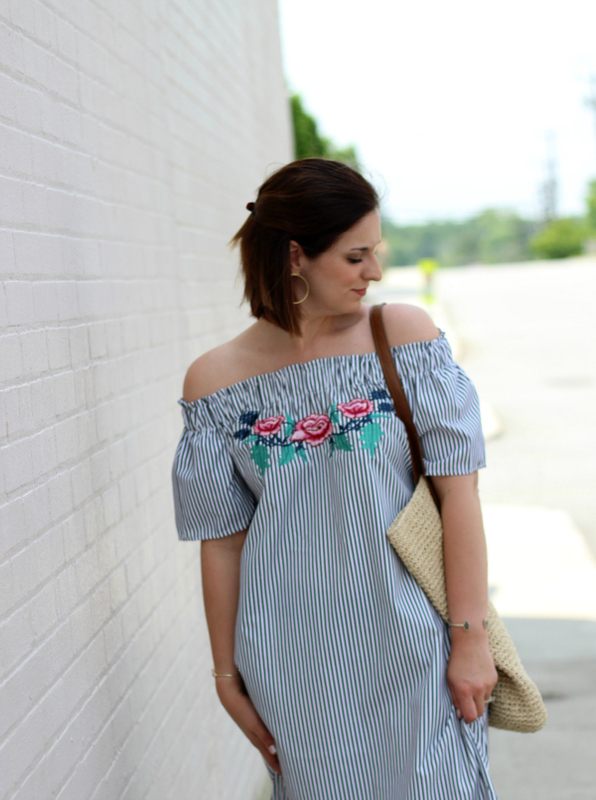 I've been loving the embroidery trend lately and this dress is no exception! The stripes add a classic spin on it and I love the way you paired it with the brown wedges. Super cute... and happens to be of the shoulder which makes everything better in my book, lol! 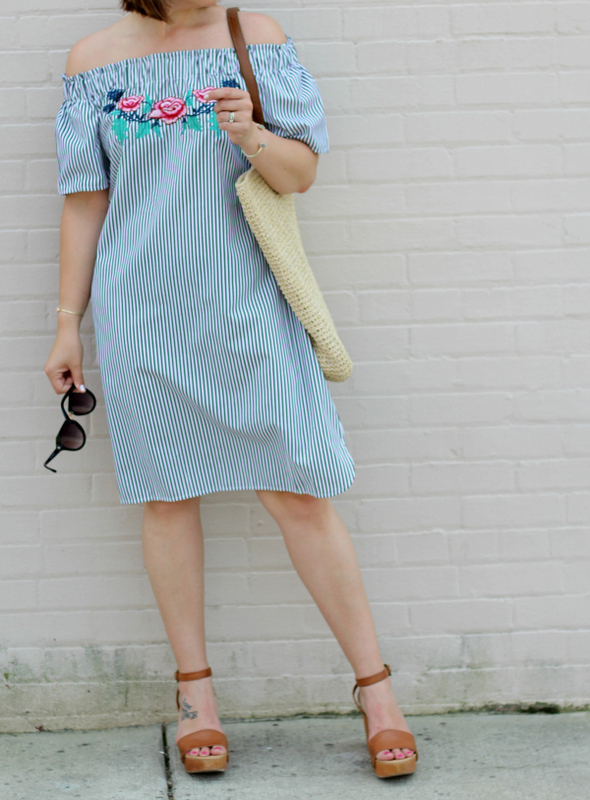 cute dress, great for summer! How awesome your husband was able to go to the DR and serve! I'm sure you'll be happy to have him back :) Love this OTS dress and those little details are too cute. Love the dress! And I love how you accessorized this outfit! So gorgeous. And that's so awesome how your husband has been on his sixth mission trip. Bless him and his heart of gold! That dress is SO cute! 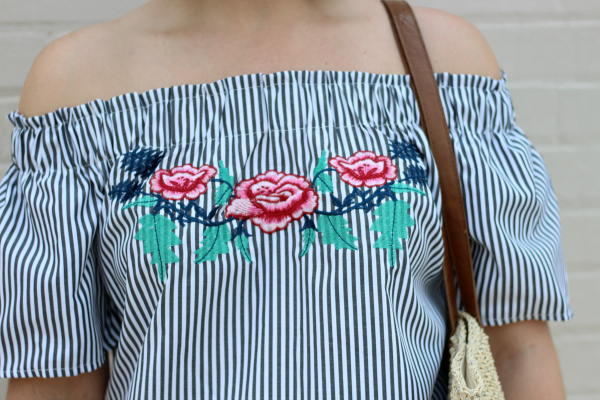 I love the embroidered details!